The ancient Romans believed that after death their souls became spirits or shades of the dead. There is some debate about the nature of Roman shades or spirits (aka ghosts). The theologian Augustine Bishop of Hippo (A.D. 354 - 430), who died when Vandals attacked Roman Africa, wrote about the Roman shades a few centuries after most of the literary, pagan Latin references to such spirits. Witches, ghosts in the night, and Thessalian portents? inferias tacitis manibus illa dabunt.
" [Plotinus (3rd century A.D.)] says, indeed, that the souls of men are demons, and that men become Lares if they are good, Lemures or Larvae if they are bad, and Manes if it is uncertain whether they deserve well or ill. Who does not see at a glance that this is a mere whirlpool sucking men to moral destruction? For, however wicked men have been, if they suppose they shall become Larvae or divine Manes, they will become the worse the more love they have for inflicting injury; for, as the Larvae are hurtful demons made out of wicked men, these men must suppose that after death they will be invoked with sacrifices and divine honors that they may inflict injuries. But this question we must not pursue. He also states that the blessed are called in Greek eudaimones, because they are good souls, that is to say, good demons, confirming his opinion that the souls of men are demons." Instead of being evil spirits, the lemures (larvae) may have been souls that could find no rest because, having met with a violent or premature death, they were unhappy. They wandered among the living, haunting people and driving them to madness. This corresponds with modern tales about the ghosts in haunted houses. No sane Roman wanted to be haunted, so they held ceremonies to satisfy the spirits. The lemures (larvae) were propitiated during the 9-day festival in May named Lemuria after them. At the Parentalia or Feralia on the 18th and 21st of February, living descendants shared a meal with the benevolent spirits of their ancestral (manes or di parentes). 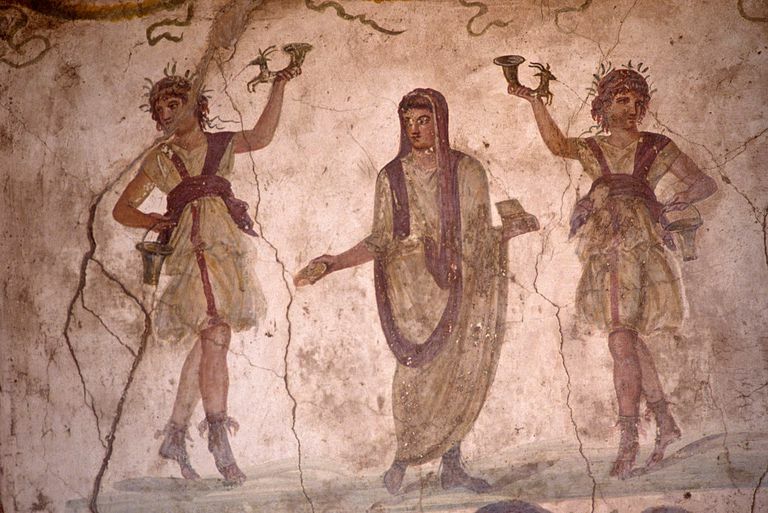 Almost four centuries before the Christian St. Augustine wrote about pagan beliefs in shades, the Romans were honoring their ancestors and writing about the ceremonies. At the time, there was already uncertainty about the origins of placating festivals. In Ovid's Fasti 5.422, the Manes and Lemures are synonymous and both hostile, in need of exorcism via the Lemuria. Ovid incorrectly derives the Lemuria from Remuria, saying it was to placate Remus, the brother of Romulus. Usually considered the same, not all ancient authors considered the Larvae and Lemures identical. In the Apocolocyntosis 9.3 (about the deification of Emperor Claudius, attributed to Seneca) and Pliny's Natural History, Larvae are tormentors of the dead. The Manes (in the plural) were originally good spirits. Their name was usually placed with the word for gods, di, as in Di manes. Manes came to be used for the ghosts of individuals. The first writer to do so is Julius and Augustus Caesar's contemporary Cicero (106 - 43 B.C.). Reference: "Aeneas and the Demands of the Dead," by Kristina P. Nielson. The Classical Journal, Vol. 79, No. 3. (Feb. - Mar. 1984). How Did the Ancient Romans Worship Their Dead? What Is Ghost Month in China?